First impressions are vital – what you wear to an interview will affect how you are perceived by the employer. Luckily, our careers consultants have some advice for how to dress well! For a formal interview (one in which you have been invited by the employer), you should always dress smartly. As a general rule, an appropriate interview outfit for both men and women is a suit. Some organisations operate a dress code of ‘business casual’ or may not have a dress code at all. This generally means you can be a little more relaxed in your approach, but you should still make an effort to look smart and avoid jeans, trainers, anything too tight and t-shirts with slogans. It’s important to do some research into what ‘business casual‘ means to the relevant company. Dress for an interview the way you would if you were going out to represent the company at a business meeting with a client rather than how you may dress for a regular day in the office. If you choose to wear a suit, dark colours – such as black, navy and grey – often work well. It’s usually best to choose a heavy fabric with a high percentage of natural fibres that doesn’t crease easily. Avoid linen as it creases easily and may make you look dishevelled. A plain shirt that complements the colour of your suit is a good choice. White looks formal and polished and pale blue can look very smart with a navy suit. If you are wearing a tie it should be matched to the rest of the outfit. 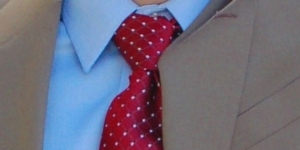 A plain block colour tie usually works well. You should also try to avoid brightly-coloured socks and keep your shoes simple. Make sure they are clean and polished. For women, either trousers or skirts (ideally knee-length or just above the knee) work well, so you can choose the option you prefer. If you want to include an element of colour and personality in your outfit, you can add a scarf or tasteful jewellery. Make sure that you can walk comfortably in your shoes, especially if you are wearing high heels! Try on your outfit a couple of days in advance to ensure that you are happy with the way you look. If you feel comfortable and confident, this will help you to relax and perform at your best in the interview.